Not only did Bruce finish up Reegan’s JH title this Spring, but he immediately went into the Senior stake and went 4 for 4 and obtained Reegan’s SH title at the Marin Retriever Club hunt test in Corning. They were awarded their title on Reegan’s 20 month birthday! What an amazing accomplishment for this fabulous team! Congratulations to Bruce and Reegan!!! Congratulations to Terri and Nessie for getting their last qualifying score to complete their Junior Hunter title! 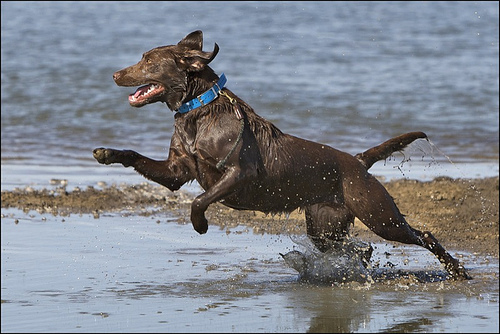 After recovering from Nessie’s eye injury at the beginning of the test season, they came back strong and finished up their title at the Marin Retriever Club test in Corning. Way to go Terri and Nessie! Congratulations to Mimi, David and Andy on completing their Junior Hunter title at the Norcal Golden Retriever Club Hunt Test!!! They’ve had a great start to the year, obtaining their 4 JH legs in February and March. Hard work certainly pays off! Great job by all three of you!! 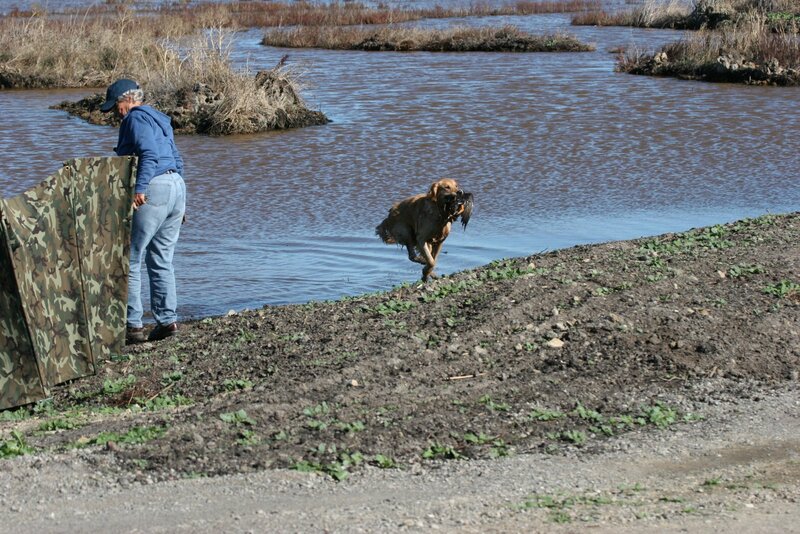 Ardith and Ryman were awarded their 4th straight SH leg to complete their Senior Hunter title at the Hills Ferry Hunting Retriever Club test in Los Banos. This fabulous team went 4 for 4 to get their title and seemed to do it with ease! Congratulations Ardith and Ryman!! We’ll be reporting on your Master accomplishments real soon! From Acorns, Mighty Oaks do grow. 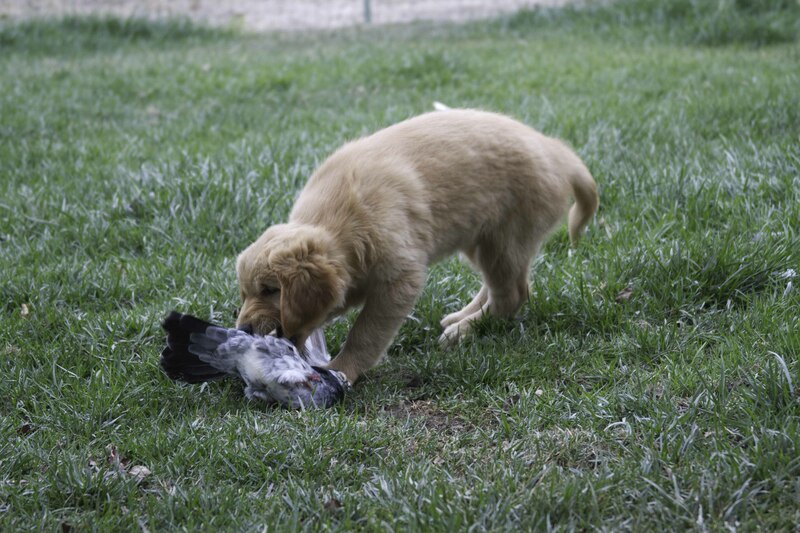 Pictured as a puppy Reegan gets her bird. She has nearly always got her bird!! After going 3 for 3 last Fall, Bruce and Reegan had to wait for the hunt test season to start up this Spring to finish up their Junior Hunter title. They did that with ease in the first test of the season to complete their JH title in four straight outings! This is a great working team that we’ll be sure to see in Senior tests soon! Congratulations to you both! Keltie (Momma Dog) and Cheryl are very proud of you both. Kathy and Teak made the long haul to Arizona in February to compete in the Copper State hunt test and it was a worthwhile adventure for them, as they came home with 2 more SH legs to complete their Senior Hunter title!!! Kathy and Teak made it look easy, going 4 for 4 to achieve their title. It’s going to be great to see them in Master next. Congratulations to this great working team! Harvey made the trek up to Corning for the Marin Retriever Club Spring Hunt Test and it was a worthwhile drive, as he and Sammy came home with 2 ribbons! These were Sammy’s 2nd and 3 JH passes. Congratulations to this hard working team! After having puppies last Fall, Monkey is back to running the hunt tests and had a great weekend at the Norcal GRC Hunt Test. Monkey and Cheryl showed good teamwork through the 3 series and were awarded with a ribbon for their great job! Congratulations to Cheryl and Monkey on receiving your 2nd MH leg!!! 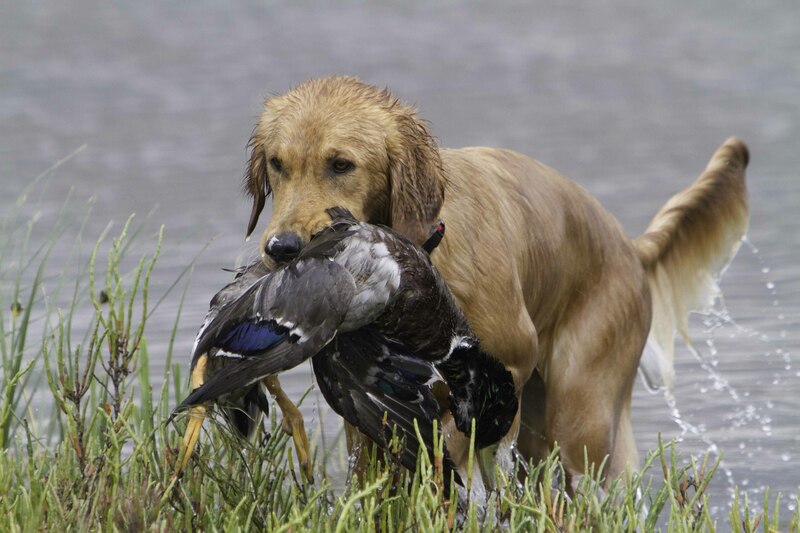 After recovering from Nessie’s eye injury and having to scratch their entries at tests in February, Nessie finally got to make her hunt test debut at the Lassen Retriever Club Hunt Test double header in mid-March. They had a great weekend and came home with 2 Junior Hunter legs! They followed that up the next weekend at the Norcal GRC Hunt Test and brought home another JH leg! Congratulations to Terri and Nessie!!! Reegan and Bruce started out the year in style by finishing up their JH title and pretty much jumped right into their first Senior tests and came home with 2 SH legs from the Norcal GRC Hunt Test! Reegan and Bruce have become such a great working team. Congratulations to both of you!! I’m sure we’ll be reporting a lot more of your accomplishments soon! Janice and Rowan made their hunt test debut at the Norcal GRC Hunt Test and came home with their first hunt test ribbon! Congratulations to this handsome boy and his proud handler!!! Keep up the good work! Congratulations to Sam and Guiness on their first Junior Hunter leg!!! They made their hunt test debut at the Norcal GRC Hunt Test and brought home their first ribbon. 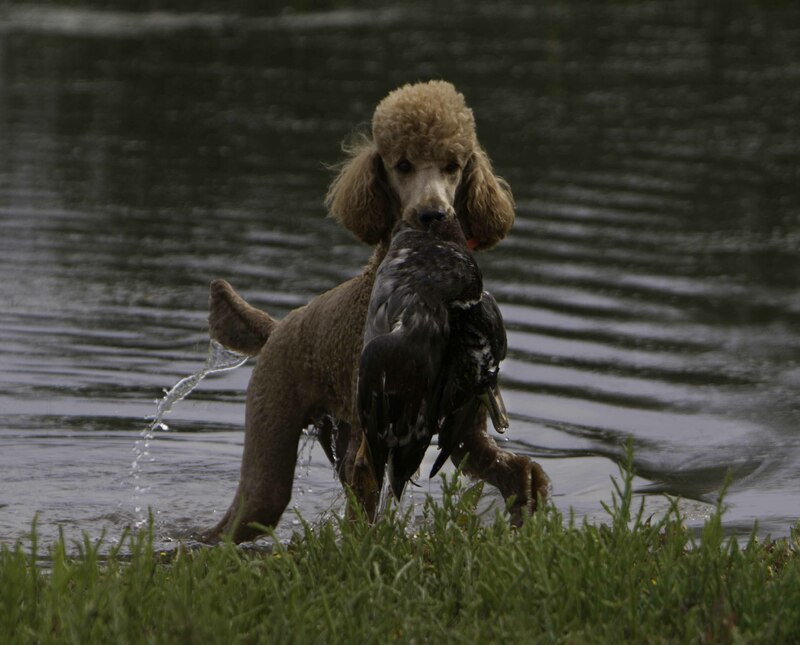 Even though they are newbies to the hunt test game, Guiness loves his birds and he and Sam are a great team. Soon we’ll be adding a hunt title to all those agility titles! 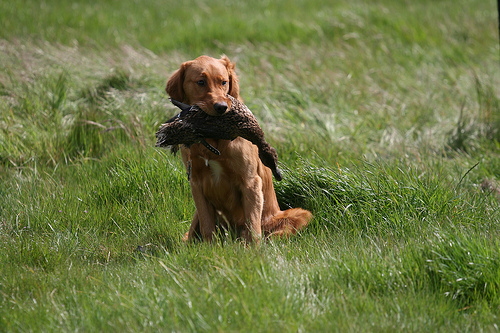 Ardith and Ryman were awarded their 3rd straight SH leg at the Monterey Bay Hunting Retriever Club test in Los Banos. They showed great teamwork in earning this leg, as Ardith commented “it was all about control in unusual situations.” All their hard work definitely paid off at this test, which Ardith also said was by far the hardest test she had ever seen! Congratulations to this hard working team! Lucy and Paddy have been working hard on their teamwork and it has paid off for them. Paddy and Lucy started out the 2012 hunt test season by taking a trip to Florida to run some tests and visit some friends. During the first part of their visit, Paddy and Lucy got in some good training while enjoying some warm weather and change of scenery. The winds started blowing and the temperature dropped just in time for the hunt tests, but Lucy proved she could still perform in those less than perfect conditions! Paddy was very proud of Lucy, as she did her job and brought back her 2nd SH leg! Congratulations to you both!! 2012 is proving to be a good year for Mimi, David and Andy! They decided to join Cheryl and some of her other students to make the trek to Arizona in February, and came home with their first 2 Junior Hunter legs! The following weekend they went to Los Banos for the Monterey Bay Hunting Retriever Club’s test and brought back another ribbon! Congratulations to you all!! We’ll be reporting on your JH title soon! Terri also made the long haul to the Copper State hunt test in Arizona and she and Spice brought home their 2nd Master Hunter leg despite having some bad luck at the start of the weekend. Terri woke up Friday to find her young dog Nessie with a bad injury to her eye. After getting Nessie checked out by both a regular vet and an ophthalmology vet, Terri managed to get back to finish the last series with Spice and get a ribbon! Talk about working under stress! Congratulations to Terri and Spice!!! Unfortunately, Nessie couldn’t make her hunt test debut as planned, but we hear she’s all healed up ready to go again. Cheryl and Gabby have started out the year on a roll, adding another 3 Master Hunter legs to their many achievements! Cheryl had a great trip to Arizona for the Copper State hunt test as well as a visit with her grandson. Gabby and Cheryl came home with 2 ribbons from Arizona! After a short week at home, they went to Los Banos for the Monterey Bay Hunting Retriever Club test and brought home another ribbon! Way to go Gabby and Cheryl!! !